1) How will they feel when the summer comes to an end? 2) Five years from now, what will they remember about this summer? Depending on the "fit" of the intern with the summer internship you're offering (as discussed in yesterday's post), an intern will either wish the summer didn't have to end, or breathe a sigh of relief that it's finally over! I met the new summer interns at my church last Sunday - two girls, one guy. I thought about how they'll feel in August. Beyond that, I wonder how they'll remember this summer when they reflect on it in 2015. 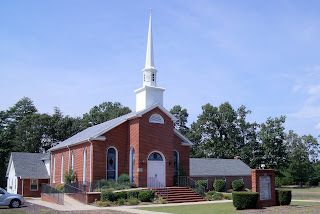 My first youth ministry internship was at a little church called Hanover Baptist Church in King George, Virginia (it's the church in the picture). It's a small church in a small town, about a half-hour from Fredericksburg. I still don't know how I convinced them to bring me on board, but they did. They had never hired a full-time youth pastor, but always relied on an intern to come in each summer to keep the students engaged and the program moving along. They handed me the keys and said, "Make it a great summer!" That sounded like a good plan, but my only real experience to that point (beyond that of a typical youth group participant) was leading a group of middle school guys at summer camp. I showed up at the church, eager to take over and lead the way to bigger and better things. I had grand and glorious fantasies of students flocking to the little church to hear me speak, and of producing an event that brought churches of all sizes and denominations together to help the town. But reality forced those fanciful dreams to a grinding halt. Not only was I under-qualified and under-prepared to handle the job, but there were no scheduled events, no summer calendar, no curriculum for teaching, no plan, and no leadership in place. I had to learn on-the-fly and in a hurry. Over the next 10 weeks I wrote some "talks," recruited some adult leaders to lend a hand, planned some events, coordinated some serving opportunities in the community, and even had the opportunity to deliver a sermon for the congregation on a Sunday morning. My experience in that little church provided me with a great experience, and I was exposed to many things that never would have come my way at a larger, more "put-together" church. I can't say for certain if my investment in the youth ministry of that church was worth the stipend I was paid, but the experiences of that summer played a central role in forming the kind of leader and person I have become today. If you are youth pastor with the opportunity to invest in interns this summer, I hope they will remember your church as fondly as I remember that little church in King George, Virginia.